We distinguish between the two types of device by saying that one obeys Ohm’s law and the other does not. Ohm’s law is an assertion that the current through a device is always directly proportional to the potential difference applied to the device. (This assertion is correct only in certain situations; still, for historical reasons, the term “law” is used.) The device of which turns out to be a 1000 n resistor-obeys Ohm’s law. The device of which turns out to be a so-called pin junction diode-does not. Modern microelectronics-and therefore much of the character of our present technological civilization-depends almost totally on devices that do not obey Ohm’s law. Your calculator, for example, is full of them. It is often contended that V = iR is a statement of hm’s law. That is not true! 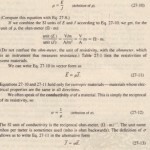 This equation is the defining equation for resistance, and it applies to all conducting devices. whether they obey Ohm’s law or not, If we measure the potential difference V across, and the current I through, any device. 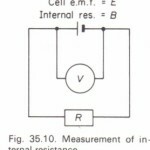 even a pin junction diode, we can find its resistance at that value of V as R = I’/i. The essence of Ohm’s law, however, is that a plot of i versus V is linear; that is, R is independent of V. We can express Ohm’s law in a more general way if we focus on conducting materials rather than on conducting devices. The relevant relation is then Eq. 27-11 (f = pJ), which is the analog of V = iR.